World map showing malaria distribution, 20012002. Malaria is one of the most important diseases affecting humans and remains endemic in many parts of the world. The causative agents (protozoan parasites in the genus Plasmodium) are transmitted by the bite of the Anopheles mosquito. Indonesia continues to suffer from a high prevalence of malaria, especially in the eastern part of the archipelago nation. In the last decade, malaria has shown a dramatic resurgence in parts of the country once considered under effective control, in particular on the island of Java. The United States Naval Medical Research Unit No. 2 (NAMRU-2), located in Jakarta, Indonesia, is a U.S. Department of Defense infectious diseases laboratory that has been investigating the spread of malaria and its control in Indonesia. In collaboration with the National Institute for Health Research and Development of the Indonesian Ministry of Health and the Purworejo District Health Office, NAMRU-2 has developed a GIS that has helped analyze the spread of malaria down to the village level in the district of Purworejo, Central Java. The Purworejo District was selected for a GIS pilot program because of the recent and well-documented resurgence of the disease in the highland areas of the district. With a population of approximately 750,000 people and an area covering 1,035 square kilometers, the Purworejo District has historically been a refractory endemic area for malaria, which has been difficult to control. Beginning in 1995, a dramatically high malaria case incidence of disease was noted there compared to most other districts in the province. In the Purworejo District, the number of slide-confirmed cases had remained stable up to 1995 at around 5,000 per year. In 2000 more than 37,000 blood slide-confirmed cases were reported. These cases probably represented less than half of the actual cases. Among the hardest hit areas within Purworejo, the annual parasite incidence (API) increased from less than 30 to more than 300 (API = [the total number of malaria cases/total population at risk] x 1,000 per year). The cause of this dramatic increase in case incidence was multifactorial, but in part was related to the general breakdown in vector control measures as a result of severe budgetary shortfalls. Additionally, the highly efficient vector mosquitoes, topography, and demographics greatly supported the transmission of disease in the highland regions. The objective of the GIS was to provide a visualization of the spread of malaria cases in Purworejo related to the differing topographical conditions and the risk of disease associated with those conditions. With the GIS, researchers and physicians have been able to present meaningful malaria case data with minimal delay, helping health planners devise specific and targeted control methods to control the spread and transmission of malaria. ArcView 8 software was used for the development of the Purworejo GIS. This software was selected because of its compatibility with other programs, its user-friendly interface, and the variety of options and tools required for the project. Using ArcView 8, the research team was able to easily organize and manage all the subdistrict maps integrated with malaria case data. 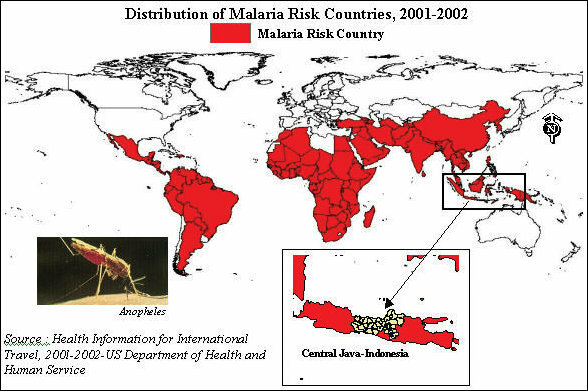 The spread of malaria in the Purworejo District, 2001. The Purworejo District is located on the southern coast of Central Java with a topography characterized by hilly areas (under 1,000-meter elevation) in the north; plains in the center; and flat, exposed coastal areas in the south. To develop the GIS, three maps were used, each representing the distribution and API of malaria by subdistricts (combined and analyzed village data) in 1993, 2000, and 2001. The maps illustrated the strong association between increased elevation and high malaria incidence. From the GIS, it is evident that in 1993 the majority of malaria cases occurred in only the more elevated eight subdistricts. 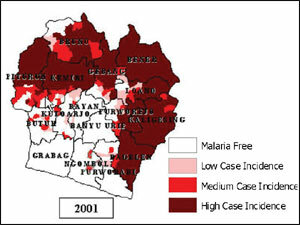 By the year 2000, however, malaria had increased alarmingly to include other subdistricts, not only those at higher altitudes but also those along the fringe zone of the adjoining central flatlands. In response, the Indonesian Department of Health launched an extensive malaria control effort that had a dramatic impact on malaria transmission in the area. The end of 2001 began to see a decrease in the overall number of malaria cases in most of the affected subdistricts. The dramatic increase in cases was compounded by the inherent difficulty to effectively control malaria in hilly terrain because of logistics and lack of resources. The higher number of cases in the highlands is attributed to the relatively high transmission efficacy of the mosquito vectors present in these areas, where these same vector species are extremely rare in rice field habitats of the flatlands and open coastal zones. The investigators have been able to show that matching topography and other associated environmental parameters to malaria risk can best be done using a GIS platform. The GIS approach of analysis for malaria in Purworejo has helped to support and sharpen real-time analysis of malariometric data collected in the field and allows for the optimal deployment of scarce resources for control of malaria outbreaks. The opinions and assertions contained herein are those of the authors and do not reflect official views or policy of the U.S. Department of the Navy; the U.S. Department of Defense; or the Ministry of Health, Republic of Indonesia. This work was supported through Department of Defense funding of Global Emerging Infections System, work unit ORA LCN #D0016. For more information, contact Agus Rachmat, Quality Assurance and Good Clinical Practices (GCP) Department, U.S. Naval Medical Research Unit 2, Jakarta, Indonesia (e-mail: rahmat@namru2.med.navy.mil); Dr. Priyanto Sismadi, National Institute for Health Research and Development, Indonesian Ministry of Health (e-mail: sismadi@litbang.depkes.go.id); Dr. M. Sururi, head of Purworejo District Health Office (e-mail: m_sururi@yahoo.com); or Dr. Michael J. Bangs (director, Parasitic Diseases Program, U.S. NAMRU-2 (e-mail: bangsmj@namru2.med.navy.mil).